Description: Manufactured in polished Nappa leather this binder has a removable 3-ring mechanism and stylish badge for engraving. 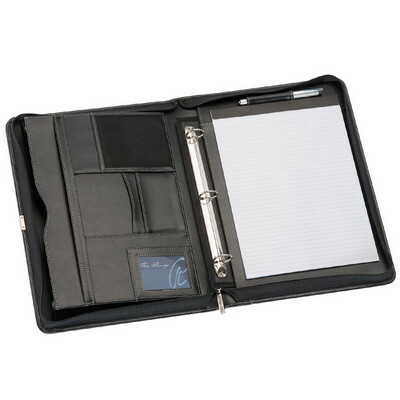 Features: Includes 3-ring removable binder, internal pocket, business card holders, ID pocket, pen loop and 25 page lined pad which insert from the top. Will accommodate a side entry pad. Metal badge engraves champagne. Ring size: 26mm Diam. ?Check out our Tablet Compatibility chart to see which tablets fit in the product. Fits Tablet Holder Item 9118. Packaging: In a polybag and presented in a plain black tuck box. ?Packaging Size: 375mm(h) x 275mm(w) x 54mm(d) Colour: Black. Material: genuine leather Product Size: 365mm(h) x 265mm x 50mm(d) Freight details : 10 per carton, 15.5kgs, 62 x 30 x 40cms; Decoration Type(s): Colour Print / Deboss / Debossed Foil / Foil Stamp / Full Colour Print / Laser Engrave / Print with Dome Decoration Area: Screen - On Front: 150mm(w) x 150mm(h). ?Laser - On Badge: 30mm(w) x 15mm(h). ?Other Methods: Contact your decorator for applicability and size. Price includes : 1 Colour 1 Position Print. Setup is included.